The Marsh Foundation has purchased the building at 102 W. Main Street in Van Wert. Melissa Gearhart, foster care and adoption supervisor (L) and Kim Mullins, executive director of Child and Family Services at The Marsh, are pictured in front of the future home of the agency’s Foster Care and Adoption Center. Submitted. VAN WERT — The Marsh Foundation has purchased the building located at 102 W. Main St., Van Wert. Plans for the building are to utilize the space as the agency’s new foster care and adoption center. The building will receive a face-lift from Alexander & Bebout over the next several weeks. Contractors will create offices, training spaces as well as a conference room. A move in date is planned for the first quarter of 2018, at which time an open house will be held for the public. The Marsh Foundation is a not-for-profit children’s services agency that provides services in a variety of settings. In recent months The Marsh Foundation has been focused on recruiting more foster and adoptive families. As a result, more training events will be taking place and more children are being placed in homes. The new office space will continue that growth giving The Marsh Foundation a convenient, accessible location to meet with prospective and current parents. https://www.limaohio.com/wp-content/uploads/sites/54/2017/11/web1_Marsh-foundation.jpgThe Marsh Foundation has purchased the building at 102 W. Main Street in Van Wert. 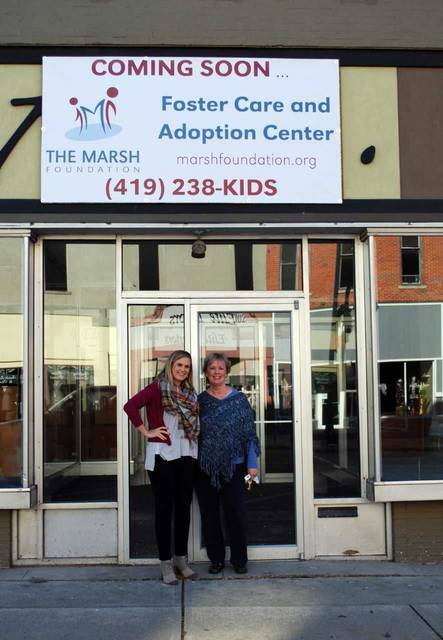 Melissa Gearhart, foster care and adoption supervisor (L) and Kim Mullins, executive director of Child and Family Services at The Marsh, are pictured in front of the future home of the agency’s Foster Care and Adoption Center. Submitted.